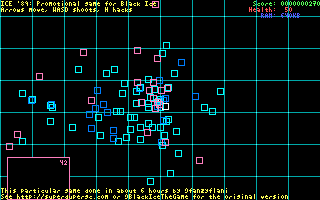 This is a demake of @superdupergc's Tron-inspired hacking FPS, Black Ice, made because he was threating to sell floppies at @GaymerX with nothing actually stored on them. Yes, I actually have his permission to release this on my page. Note, this game is for MS-DOS, OR an IBM-compatible with the 320x200 256-colour VGA/MCGA mode and some way to boot off a floppy or floppy image (El-Torito, anyone?). It has been confirmed to work in FreeDOS (bootloader not tested on real hardware yet due to lack of floppies on my end @superdupergc tested it himself and confirmed that it does work on real hardware). The platforms listed are just platforms I know which have a version of DOSBox (which also works). QEMU also works just fine (it uses the bootloader). This game is Open Source! Like, really! I'm not just saying there's source code, it's actually MIT-licensed! So, here's some suggestions. Get it under the 4KB mark! That 760-byte font can be squeezed down to 190 bytes, and that 736-byte line_grid* stuff can be generated in less than 50 bytes of code! All without using a cruncher! Increase the framerate from 18.22fps to something higher! Draw an RLE-compressed Black Ice logo! Manage to still keep it under the 4KB mark! Stick a proper "Game Over" screen in! Split the source into several files instead of leaving it as one long 1778-line mess! Make it actually resemble Black Ice!